Revelation 18; The Light Of The Cross Wins! I am writing this morning from the beautiful Tampa Bay area. I am sharing this picture I took of the sunrise at Key Largo last December. This is my favorite verse in all of Revelation! For centuries Satan tries to keep the world in spiritual darkness but he can’t keep away the light of God’s love! After the dark ages, the light of God’s love lights up the whole world! Last Tuesday evening, I walked into our group Bible study that we have each week at Panera Bread. Not only was my study group there, but each week there is another group of people meeting at the same time and place for a Bible study. I got up to get a refill and saw a man at a table studying the Bible too! I thought to myself, what would Martin Luther think, after having to skip meals to study the only Bible he had access to, chained to a wall in a lonely monastery basement, if he could walk into this restaurant tonight and see two different Bible study groups and a man alone, eating and studying the Bible in a public place! What would Martin Luther think, if today he could see that the Bible that was chained to the lonely basement wall is now printed around the world and is also on our computers, laptops, notebooks and cell phones! What a wonderful time to be living! Truly the world is becoming lightened with the glory of God’s love, forgiveness and mercy! Seize the moment my friends! Take out your Bibles that men, during the dark ages, shed their blood to preserve! With great painstaking effort they have made it possible for you to have the Word of God readily available so you can read and see what Satan has worked so hard to keep you from understanding. God is love! And He loves you! If you find it hard to understand, just ask for the same Holy Spirit to help you which also helped them. 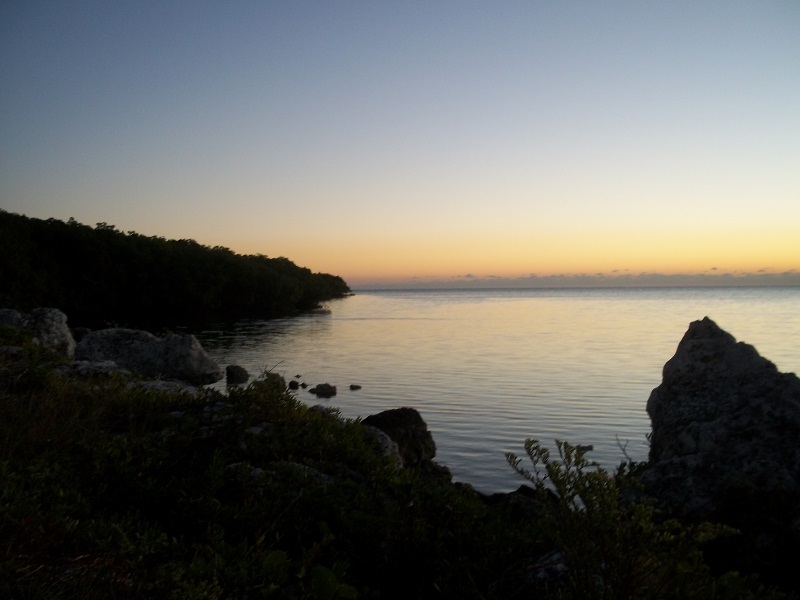 Last December I went to the Florida Keys and took this picture of the sun rising on Key Largo. I thought how wonderful that after several hours of darkness, that God lets the sun simply pierce the darkness with the morning star and slight glow before letting the sun suddenly rise with all its glory. Such light all at once would be blinding and not welcomed! God in His infinite wisdom, has allowed each reformer during the dark ages, bring us a piece of God’s light and love one by one so as not to blind us all at once. Still, God in His own perfect timing, after the dark ages, lights up the whole world with His glory and love! As I stood that dawn, watching the light pierce the Atlantic Ocean, I could not help but remember Isaiah 11:9, “for the earth shall be full of the knowledge of the LORD, as the waters cover the sea.” Yes we are living in an exciting time, and when I walk into Panera Bread and see people studying their Bibles, I think to myself, this can only be good! 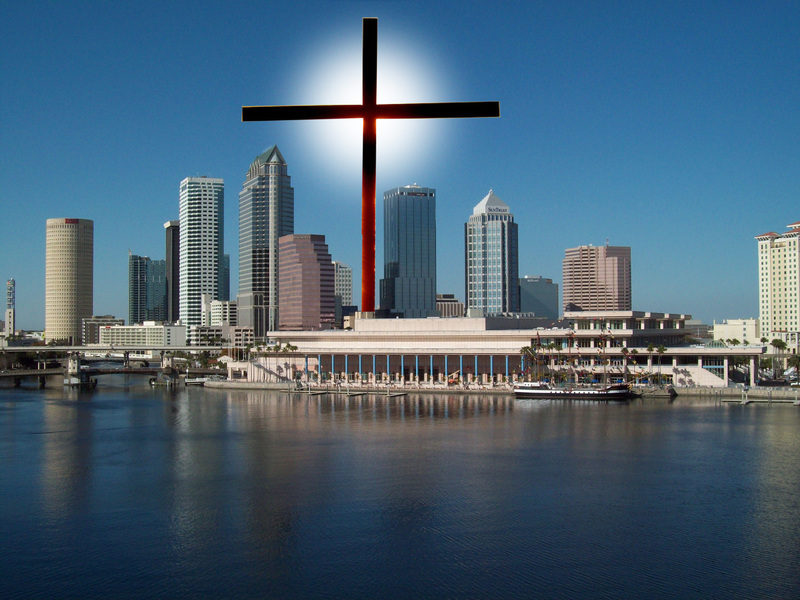 If you would like to join a Bible study group in the Tampa Bay area please let me know! You can contact me at LayPastor@TampaAdventist.net or 813-933-7505. New study groups are starting all the time! I even have a second study group now meeting at Panera on late Friday afternoons as well as the one I have on Tuesdays. If you are not in the Tampa Bay area call me anyway and I will find a Bible study in your area! Mark 8 :29 And he saith unto them, But whom say ye that I am? And Peter answereth and saith unto him, Thou art the Christ. 8:35 For whosoever will save his life shall lose it; but whosoever shall lose his life for my sake and the gospel’s, the same shall save it. Peter could not comprehend or imagine Jesus being crucified. I think this is why Peter was so sure of himself, when later he swore he would never deny Jesus. I think he made that promise while only thinking of Jesus upon a throne, never dreaming Jesus would be crucified on a cross. Jesus rebuked Peter, because Peter was telling Him he did not need to die to self on the cross. Jesus at once recognized this as a message from Satan. Earlier Satan had told Jesus He would not have to die if He would just worship him. If he would, then Satan would give Jesus the world back without Him needing to die. Long before this, Satan spoke through false prophets in the Old Testament, prophesying smooth things that kings longed to hear. The kings would get upset when a real prophet would prophesy about death and destruction, because they did not want to hear it. Peter did not want to hear it either. Peter only wanted smooth things prophesied to him. Jesus, the King of Kings had to overcome where the former kings failed, and be willing to accept a prophecy of death and loss. Jesus gives Peter a further rebuke, when he tells him that if he is ashamed of these words about the cross, then Jesus would also be ashamed of Him when He comes in glory. Peter, who at the time could only imagine a throne and glory, finally found that glory-in the cross. He who loses his life finds it. Jesus was glorified after he was crucified. Do you want glory and honor and a throne too? Then pick up your cross and follow Jesus in death to self. Find the glory that many Old Testament kings greatly desired, but were never willing to die to self for.